I read this article and found it very interesting, thought it might be something for you. The article is called AAP Is Unique But Not India’s Best Political Debutant and is located at https://archive.indiaspend.com/cover-story/aap-is-unique-but-not-indias-best-political-debutant-55177. 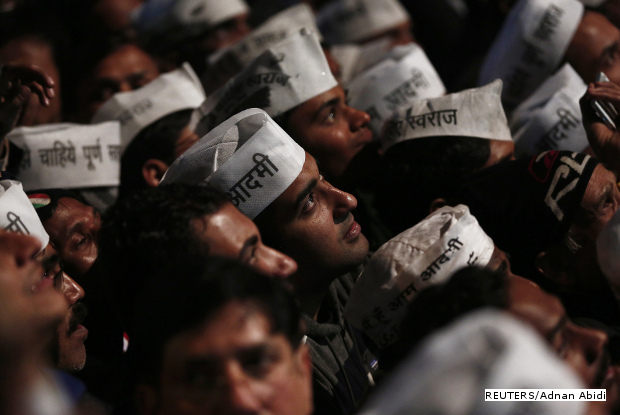 With the Delhi election battle heating up, a larger question emerges: India is no stranger to new parties, so is the Aam Aadmi Party (AAP) a flash in the electoral pan? An IndiaSpend analysis reveals the AAP is exceptional in its main electoral plank, but it is unexceptional in its electoral impact. There is no party in India that has come to power in any state promising clean governance, transparency and accountability. In December 2013, AAP surprised political pundits in its debut elections by winning 28 seats in the 70-seat Delhi assembly, which was a completely different outcome from what was predicted in opinion polls. Time and again, new parties in India have emerged in the states, but their politics has always revolved around regional issues. Some of these parties were breakaway factions of existing parties, while others were new. In this respect, the AAP is an exception. Initially a movement against politicians and corruption, it has evolved into a political party. How does its debut performance compare with other newbie parties? 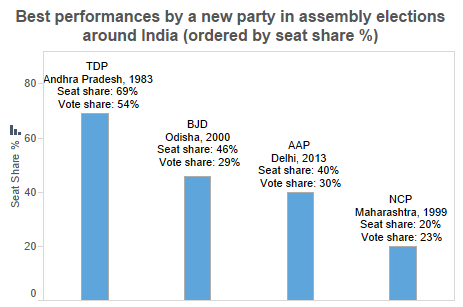 Let us analyse the first elections fought by different debutant parties. These are the top four electoral debuts ever. 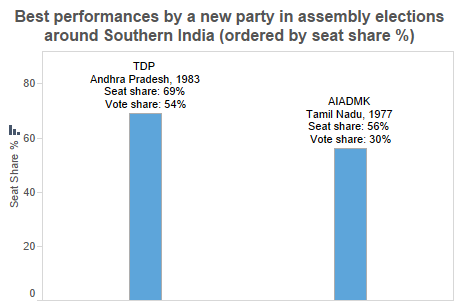 Overall, the Telugu Desam Party (TDP), led by N T Rama Rao, performed the best among first-timers with a 68.7% seat share and 54% vote share in the 1983 Andhra Pradesh assembly elections. 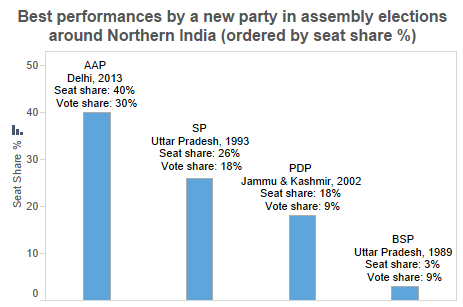 Among northern states, AAP is the best-performing debutant party ever; with a 40% seat share and 29.7% vote share in the 2013 Delhi assembly elections. 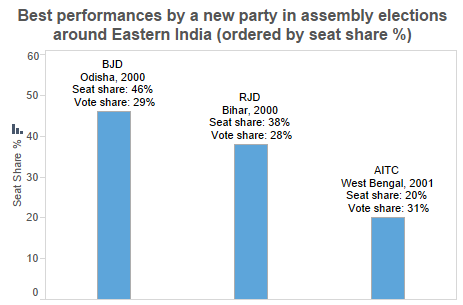 Among eastern states, Biju Janata Dal (BJD), led by Naveen Patnaik, is the best performing debutant party, with a 46% seat share and 29.4% vote share in the 2000 Odisha assembly elections. It was voted to power for its fourth consecutive term in 2014. The AIADMK, which broke away from the DMK in 1972, is the second best-performing debutant party in South India, with a 56% seat share and 30.4% vote share in the 1977 Tamil Nadu assembly elections. 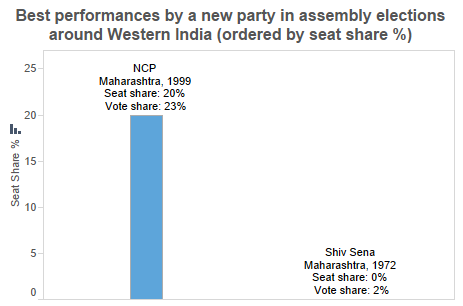 In western India, the Nationalist Congress Party was formed in 1999 by Sharad Pawar, P.A. Sangma and Tariq Anwar. It fought its first election in 1999 on its own steam and won a 20% seat share and 22.6% vote share, thus making it the best debutant party in Western India. But the major difference between AAP and other debutant parties is that the AAP fought the Delhi elections on a unique national issue, corruption, which it managed to localise. * CPM, NC and DMK haven’t been considered because they are much older and were formed in 1920, 1939 and 1949 respectively, and so they do not fall in the category of new parties fighting for particular issues. Figures in charts have been rounded. Data taken from Election Commission website and news reports. What about YSRCP in AP 2014?